TRACY, CA--(Marketwired - Sep 11, 2015) - For a limited time, save on quick move-in opportunities available on new single-family homes at Maplewood in a desirable Tracy setting. Part of William Lyon Homes' Pick and Pack Savings Event*, homebuyers are invited to visit the sales gallery to find out how they can pick their favorite way to save on design studio credit, closing cost savings or additional appliances and start packing for a quick move-in to their new residence. Featured homes include Homesite 13, a beautiful Residence Three spanning approximately 3,092 square feet. This spacious two-story residence is ideal for family living with a convenient first-floor bedroom, a versatile bonus room and an impressive great room with surround sound. Well-appointed interiors boast more than $30,000 in upgrades including built-in Whirlpool stainless steel appliances, Maple kitchen cabinets with granite countertops, custom interior paint and much more. Visit www.LyonHomesMaplewood.com to learn more. "Now is the perfect time to buy at Maplewood during the Pick and Pack Savings Event," said Kathy Floyd, Director of Sales for William Lyon Homes. "The event will only last for a limited time, so I encourage buyers to visit the sales gallery soon and find out how they can receive a great value on an incredible new home." Additional neighborhoods participating in the Pick and Pack Savings Event include Cielo at Palmilla in Brentwood and Victory at Vista Del Mar in Pittsburg. Visit www.lyonhomes.com/northern-california to find out more about the quick move-in opportunities available at these neighborhoods. Located in an established Tracy community, Maplewood's distinctive new home designs range from approximately 2,878 to 3,324 square feet, with four to six bedrooms, three to four baths and two-car attached garages. Finely detailed exteriors boast Spanish, French Country, Colonial and Craftsman architectural styles and large covered patios. Prices start from the $500,000s. Maplewood's location puts the Altamont Corridor Express 'ACE' Train within walking distance and offers easy access to the "H" Train commuter station, I-580, I-205 and I-5. Offering easy access to local schools, Maplewood is also across the street from a park that includes a tot-lot, playground and half-court basketball. Baseball and soccer fields are also found at nearby community sports facilities. During the months of September and October in 2015, brokers will receive a 4% referral fee per closing. Brokers must bring client on first visit to register for broker referral fee. Buyers cannot be registered online prior to first visit. Broker referral fee to be paid at the close of escrow. To visit Maplewood, travel east on I-205, exit 11th Street and turn left at Crossroads Drive, then left on Solomon Lane. 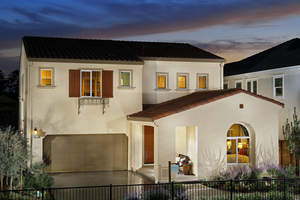 The Sales Gallery is on the right and is open daily, 10 a.m. to 6 p.m. For more information, please call 209.221.8946 or visit www.LyonHomesMaplewood.com. Prices, plans and product information subject to change. *All homes subject to prior sale. Buyers must purchase between September 12, 2015 and October 31, 2015 and close escrow by December 18, 2015 to qualify. Homes that do not already have flooring are subject to added price if upgrade is selected by buyer. Prices and availability of homes subject to change without notice. See sales counselors for details. Residence Three at Maplewood in Tracy.